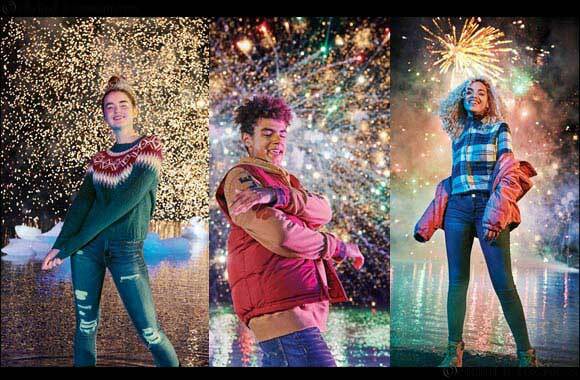 Building on from the success of last year’s holiday campaign, American Eagle announces the launch of ‘GIVE. LOVE. JEANS’. Dubai, UAE, December 04, 2018: The campaign, which features a breathtaking video shot in Iceland, surrounded by mountains and glaciers, speaks to the spirit of the holiday season, with bright, burning fireworks and festive celebrations. It presents an entirely self-styled cast, made up of real kids reunited from previous campaigns; each collaborating with the brand to share their style and creativity. Further highlighting the brands commitment to providing un-retouched imagery, the campaign is Photoshop-free and a celebration of diversity and inclusivity. Gifting is a key focus for the season. It’s about giving gifts that you love, to those that you love. With this in mind, American Eagle has created its most expansive denim collection yet. The inclusive assortment, which embraces all body types and is available in True You Sizing (up to size 20 in women’s and waist 44 in men’s), offers maximum comfort and fit – making the perfect gift for everyone on your list. The key style for women include the brands best-selling fit, ‘the jegging’, now available in Ne(X)t Level denim; an advanced, four-way stretch fabrication, designed to move with you. For men, there’s the slimmer takes on the ‘original straight’, with the relaxed and slim fit styles such as ‘slim taper’, as well as ‘the skinny’. Along with denim, there are gifts for the athleisure lovers, with hoodies and joggers, crafted in an ultra-soft, comfortable fleece. For women, the texture trend will remain key with waffle knits, teddy bear fleeces, corduroy and Sherpa sleeves. For what’s next, head over to @americaneagleme, and check out the hashtag #GIVELOVEJEANS on social, to follow along with the campaign cast and view our holiday collection.